Today, 1st. October 2008, double celebrations fill the air in our home! 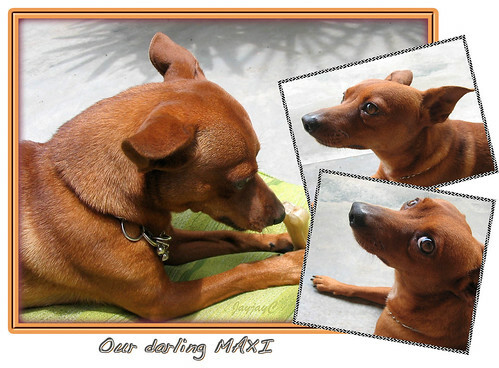 Our darling Maxi is 4 years old and it is also our third wonderful years of loving companionship with him. AND MANY MORE WONDERFUL YEARS WITH US! Here is sharing some shots of him taken recently to celebrate the occasion. Charming and playful, Maxi by nature is very inquisitive, agile and so alert. 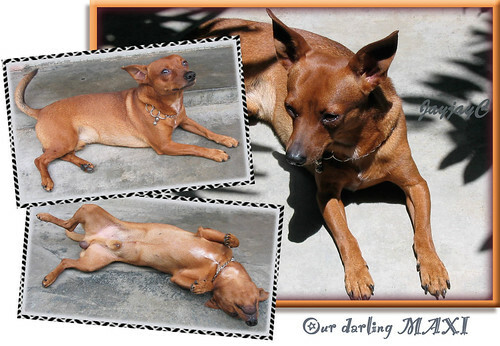 A very lovable and adorable pet with boundless energy, Maxi is frequently seen on the move around his kingdom, the backyard garden where he resides, either chasing and barking at any stray cats that come so often prowling behind or any strangers walking by. This is how he gets his exercises, but of course, all within the fenced area of our backyard. 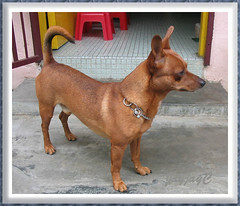 He absolutely detests the cats, and his incessant loud and sharp barks have taught them to walk along the drains beneath, smartly out of his sight. Even birds perched on our fruit trees or plams riles him. So territorial! Nevertheless, he is such a cute and sweet child! Standing on tippy toes is another of his favorite posture! We just love to see him standing tall like this which he usually does when waiting to be fed or expecting something or anything edible. Haha, he gets a lot of teasing from me in this area. So greedy, seems hungry all the time! He really warms our hearts and bring sunshine to our days with his cheerful and adoring ways. Such a marvelous playmate and companion in our golden years. MUCH THANKS, DEAREST BOY! WE LOVE YOU SO VERY MUCH! WE PRAISE AND THANK YOU LORD, FOR THIS WONDERFUL GIFT OF MAXI!